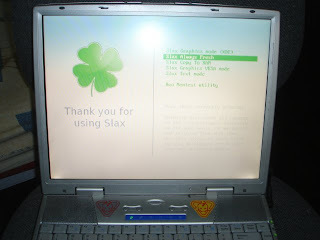 My first good impression of Slax was documented on my Slax, the Shrunken Slackware post. 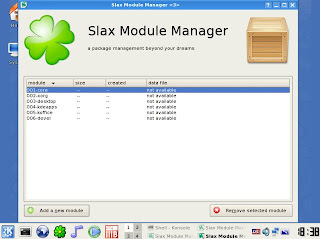 It was with Slax 6.0 RC7, a development release version which I tested under VMWare Server. So recently, I decided to take a closer look at Slax, by getting the latest “Distribution Release” which is version 6.0.3. 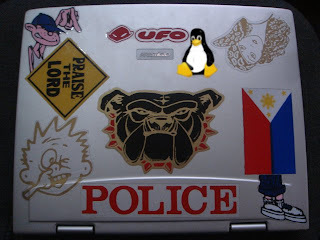 This time, I’m using our ancient Prestigio 109 laptop to fully check the features and capabilities of this tiny distro. By the way, you can get Slax from their project website HERE. This old mobile computer of ours has 1GHz VIA Nehemia processor, 256MB RAM, and 20GB hard drive. The hardware specifications may not seem that old to some of you, but if you’ll compare these to today’s laptop specs, you will agree with me. Just a little history of our beloved Prestigio 109 laptop; its original operating system is Windows XP. 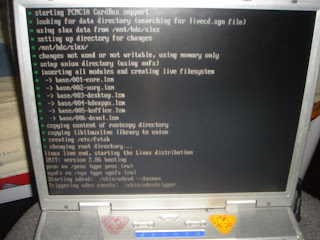 I decided to install Zenwalk later on after my wife complained that XP is starting to run like a turtle. I then switched to Ubuntu, then Mepis, and then finally settled with Xubuntu. So how did Slax 6.0 get along with our ageing not-so-portable machine? Read on. When the Slax Live CD was loaded, I was greeted with the familiar Slax boot options menu screen. I had a choice to start Slax in the default Graphics mode. I also had an option to copy Slax first to RAM to make it run faster, to start it in Text or command prompt mode, or to begin in VESA mode. I opted to start Slax the default way and then let it boot. Without delay, I was taken to the Slax KDE desktop. 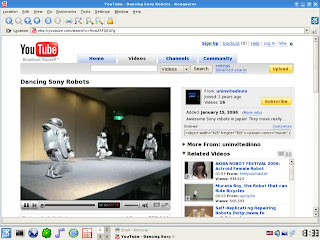 The desktop look is still the same since the RC7 version of Slax. It's cool-looking default wallpaper and its splash image are still unchanged. There’s really nothing fancy about its overall appearance, just a simple KDE desktop with very minor customization. But, I don’t want to judge the book (I mean the distro) by its cover alone. 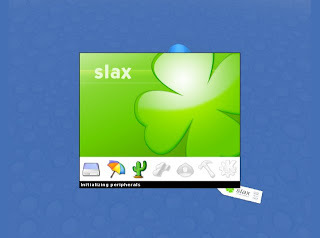 Slax comes with plenty of useful applications to keep the average desktop users happy. 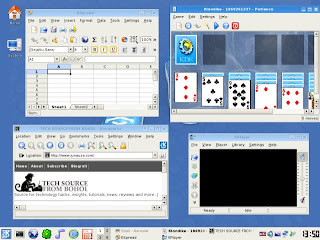 Some of its included free/open-source software packages are KOffice suite (contains a word processor, spreadsheet, and slide presenter), Kuickshow image viewer, KolourPaint (where’s Gimp? ), Kplayer (video player), JuK (audio player), K3b (CD/DVD burner), Perl scripting language (where’s Python? 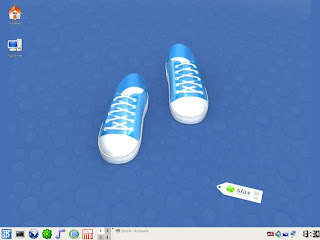 ), KWrite (Text Editor), Konqueror file and web browser (where’s FireFox? ), some games, and plenty more. Flash is already installed by default so you don’t have to worry about it if you are into watching Youtube or any other flash-based videos. There’s a Slax Module Manager with a purpose of getting and installing additional packages, but it seems the modules are not available (see screenshot below) in this distribution release. I find it odd because the modules were available in the “Release Candidate” version without me having to configure anything. I'm sorry to say that I just didn’t have the luxury of time to dig further and find the cause of this problem. The good thing about Slax 6.0 is that it jelled well with Prestigio 109 laptop’s old hardware. The audio, USB, CD drive, and Ethernet were properly recognized and were functioning the way I want them to function. The display was also correctly set to its default 1024 x 768 resolution. I really had no problem hardware-wise and I can say that it was smooth sailing all along. Because Slax is fast and lightweight, it is naturally an ideal distro for older computer machines like our ancient laptop. However, I must say that it is still not for everyone. I think it is not yet ideal for Linux beginners since newbies will probably need a distro that is a lot easier to use and has a widespread community support. Also, there are still issues that need to be fixed like the one I said above. But, as I’ve stated before, Slax is a good tool for those who are technically oriented because Slax can be utilized for rescuing a broken system. Or if you are willing enough, it is possible to build your very own Linux distro out of Slax. Though Slax 6.0 needs a little improvement, I feel that it still a quality, reliable, and stable distribution release. I will be keeping an eye on Slax and hope for the best on their future releases. Great and well-written view on Slax. Nice to see you doing reviews again Jun. It is a nice article, but I thought you said "ancient laptop". Trot out an old 486 and let's see what happens! Let's say I wanted to throw Linux on a Pentium 133 with 32M of memory (Its brother with only 24MB has been running Redhat 6 (I think) quite comfortably for the last 10 years or so but I'm not sure if I can even find a RH 6 or similar era install CD anymore). Any one want to suggest a distro to use?